Your "Destiny" awaits you here in the beauty of the prestigious Ocean Sands community. This outstanding home features many amenities to make the whole family happy. Hold a movie-thon on a rainy day in front of the 55” inch flat screen TV in the entertainment room, or soak your everyday stresses away beneath the stars in the hot tub. It’s easy to enjoy fun family time in one of two game rooms, and Wi-Fi is available as well! With lots of little extras to make a vacation truly decadent and comfortable, as well as ample room to stretch out and relax and a beautifully coastal decor scheme, Destiny is an enticing getaway where idyllic vacations are easily achieved. The interior of Destiny is a shining example of what beach relaxation is all about, and guests will find plenty of additional enticements in the neighborhood. Enjoy a 5-minute stroll to the beach – or a quick ride via the home’s on-site bikes – thanks to a great location that’s just 0.2 miles away from the beach access. 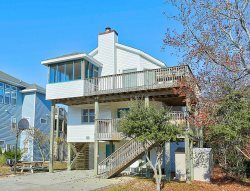 Coveted Corolla attractions, including the Lighthouse, the Whalehead Club, and a collection of shops and restaurants, are also a quick drive away, and the peaceful neighborhood setting is refreshingly family friendly. From the inside out, no shell has been unturned when it comes to decadent ways to enjoy your Outer Banks Destiny! .2 mile /5-minute walk to Porpoise Point beach access. RVs, campers, trailers, and golf carts are not permitted at this property.